The National Weather Service is predicting a wintry mess to begin the second day of spring Wednesday, with overnight rain turning into a mix of rain, snow and sleet by 8 a.m. with a full changeover to snow by 11 a.m. 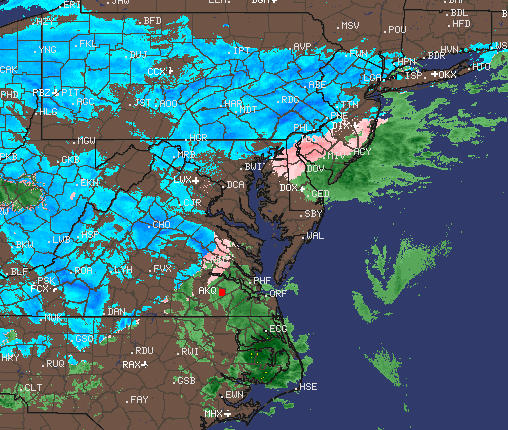 Forecasters with the National Weather Service pointed to the storm centered south of New Jersey early Wednesday morning that showed lightning strikes and “thunder snow” offshore, and warned that the wicked weather could make its way inland. The snow could be heavy at times Wednesday. The NWS forecast notes two periods of accumulating snow Wednesday. During the day, after the morning changeover, 4 to 8-inches of snow will fall. Wednesday night, another 3 to 7-inches may fall. Locally, even slight temperature changes could affect totals, which are generally thought to be limited to a foot or less. The snow will end by 4 a.m. Thursday after a “blustery” night, with winds during the entirety of the storm system gusting to about 40 m.p.h. and sustained around 25 m.p.h. The melt will begin immediately. Thursday’s high will be 44 degrees with abundant sunshine, and rain showers could move in Friday. Officials from local towns were urging residents to ensure their storm sewer drains were clear of debris to help avoid flooding.